This thing they call parenting. Well, maybe it didn’t start that way, exactly. Our reunion with the kids in August was bittersweet. We adored seeing their faces again and realizing how much they had grown in two brief months. It was amazing, we were finally here together, forever! More smiles, more personality… but also more tears. 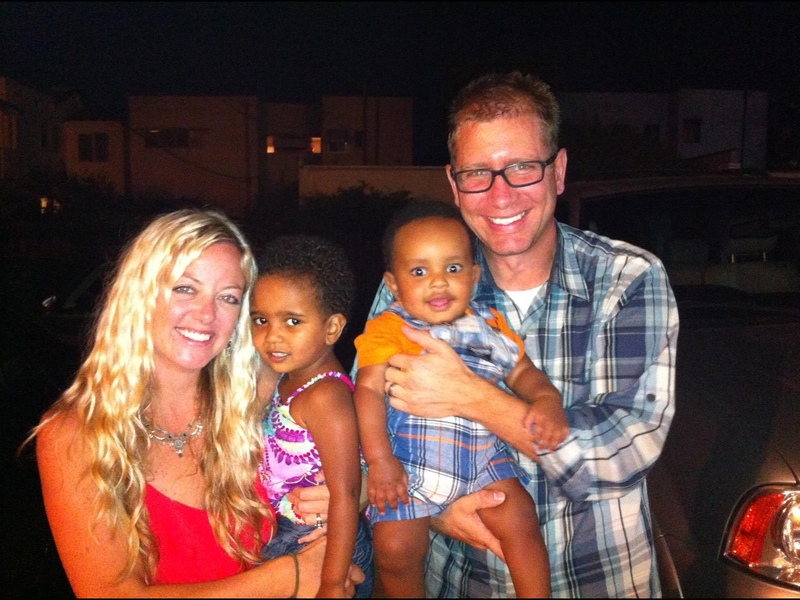 It became very evident to us as we bid farewell to their “home” in Ethiopia just how broken you can feel as an orphan. 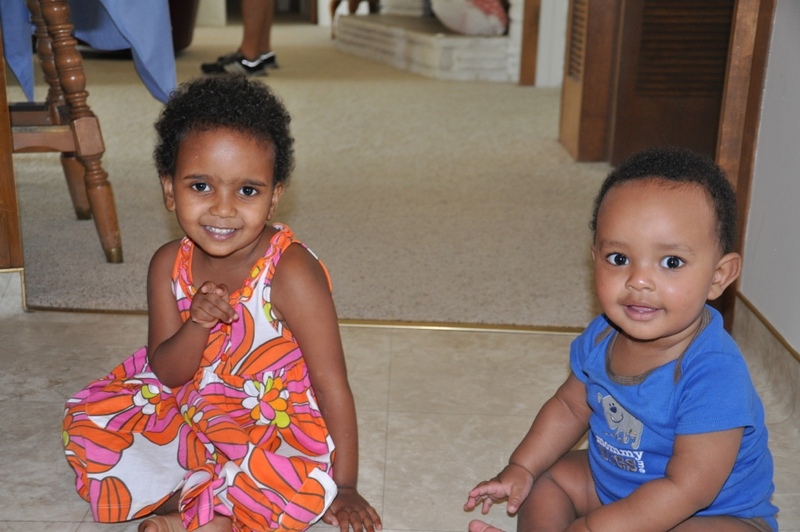 Their tiny but cozy home with 20 other kids was all they knew for the last several months. It consisted of their small boxed beds, injera and pastas for meals, 5-6 Ethiopian women caregivers, lots of rainy weather and of course not a single word of English. Though our arms and hearts were warm and full, we stripped them away from a piece of comfort and I remember tears slipping down my cheeks as we walked away. Perhaps, this was the “loss” that I now was beginning to understand that was connected to adoption. There was a realization that although one day in time, all would blend together in harmony, today our joy hit a slight pause button. Our travel home was definitely a taste of this fear, frustration and fatigue all mixed together. In all honestly, it was a taste of hell. Ha! 26 + hours with a child screaming at the top of her lungs, pushing you away, kicking the back of other’s seats, and attempting to bite you sounds delightful right? Haven was simply a wreck. Though there were a few good moments, the majority of our trip made me want to drop her off in the bathroom and sneak up into first class and recline with a margarita. I have never felt so tired and helpless in my entire life. We were trapped, with no way to communicate and nothing to appease that child. Triumph, on the other hand, was an angel and was probably confused for the entire trip why we were so blonde. He ate, slept, and nibbled on Ababa’s (daddy in Amharic) glasses. His gorgeous dimples were evident from the start and all the cute Dutch flight attendants couldn’t get enough of him. And then there was America! The stroller? Hated it. The carseat? Despised it. Walking independently? Don’t even think about it. Well, this lasted about a week, and then slowly, our children were introduced to snacks. And apparently, snacks make the world a better place. Haven and Triumph quickly learned to love walks to the lake to visit the ducks. They’ve soaked up the rays and splashed at the pool. And, yes, they’ve been introduced to Elmo. Haven, our 3 year old daughter, is a vacuum at the dinner table and has ingested anything from kale to salmon and blueberries to hummus. Despite the doctor telling us that she is in the 10th percentile for weight and 1st percentile for height, I have a feeling this bud is about to blossom. Her sponge-like attitude for learning has allowed her to expand her vocabulary like crazy, but her favorite words are repeated a hundred times a day. Mama (of course), Ababa, Amanu (her little bro), doggies, Noni (her grandma), carrot, banana, avocado, flower and more. 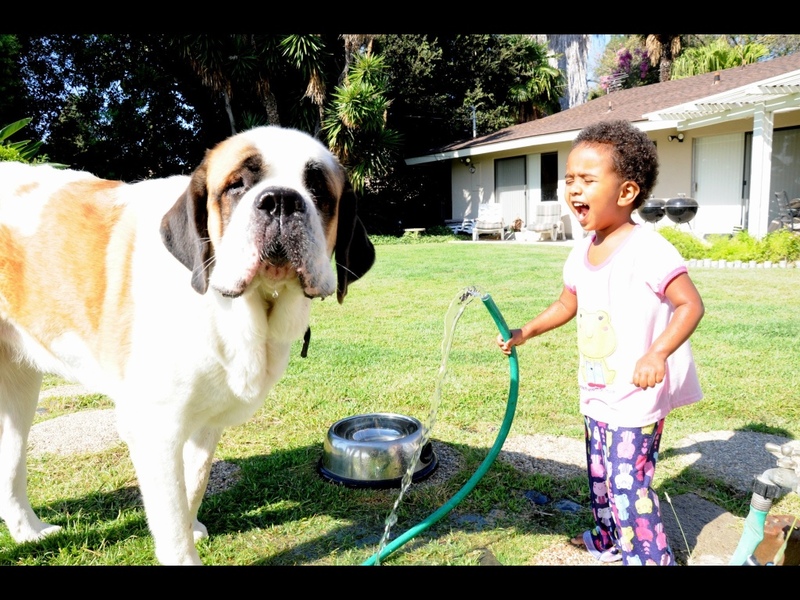 Haven’s sassafrass personality allows her to feed and water our 150 lb St. Bernard (when she weighs 26 lbs), jump into chilly ocean waves (even though she’s never seen an ocean), and pick up a plastic cell phone and have an entire conversation with her imaginary bestie. She has gone from some insanely, terrible angry tantrums to the most precious gem of a little girl. Triumph, our 10 month old lady magnet, is just too easy to love. 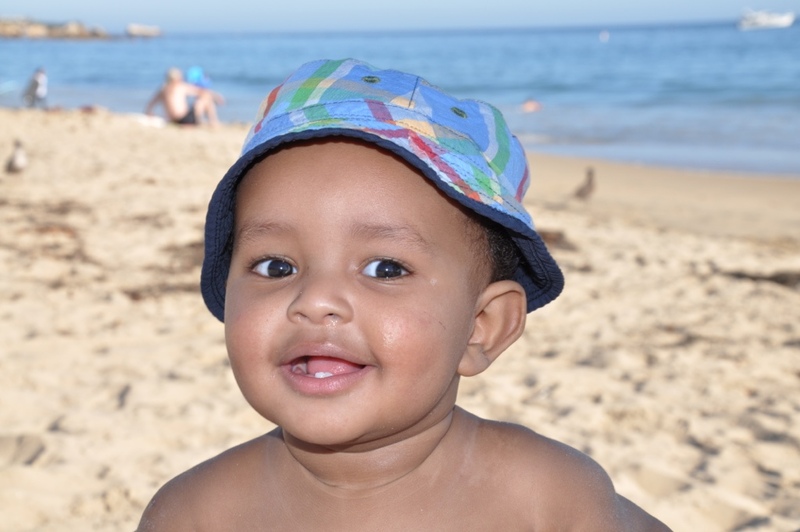 He’s addicted to his bottle, and will get pretty anxious about getting it on schedule, but other than that, he finds happiness anywhere, anytime. 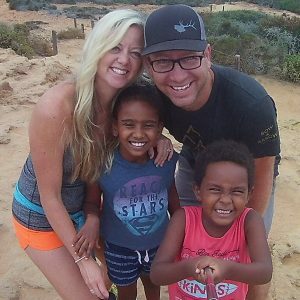 He, as opposed to his sister, is in the 67th percentile for height and 76th percentile for weight, so he is keeping his options open for both the European and the American football. Naturally, being named after amazing motorcycle, he has a fascination with motors and machines. Sometimes he can spot an airplane before us and is perfectly entertained for hours watching cars drive by. He’s crawling, fast, and I’m sure will be running before we know it. His laughter melts our hearts and we simply can’t kiss him enough. So friends, though we have been slightly in hiding with them over the last month, we do hope you all have the chance to meet them soon. Our “small world” is allowing them to open up and truly be themselves. We are deeply thankful for your prayers and words of encouragement over the last 4 weeks. Heaven knows we needed it. There have been several days we have felt exhausted, desperate and discouraged but God has carried us down this exceptionally great road of adoption and we can see so much progress as we look back at what He’s done. As we rock the babies to sleep at night, we sing, we pray, we cry, we giggle. He is weaving us together, minute by minute, and yes, parenting is a beautiful thing because God created Haven and Triumph specifically for this family and we couldn’t be more thankful and blessed.